Theatergoers of a certain age surely remember relatives sharing vacation photos in slide shows, and the jokes about how tedious they were. Writer-performer Josh McIlvain does, but makes his Slideshow a fascinating fictional history of long-ago road trips and family gatherings as his 1950s through 1970s character travels the world in search of himself. It’s easy to forget, during his 75-minute solo performance, that this innovative and absorbing work stems from strangers’s old slides stitched together by McIlvain’s clever, seemingly rambling, off-the-cuff commentary. It’s a great idea, executed skillfully. While I saw Slideshow at Moving Arts in Mount Airy, it belongs in (and often plays in) private homes with people crammed together to watch. McIlvain props up an old slide projector with a stack of books and unfurls a portable screen. He uses a remote to switch slides — a remote on a cable, as such things worked circa 1978 — and passes a bowl of popcorn and cans of beer. He plays cassette tapes on the sort of player we called small back then, the size of a 500-page hardcover book. At first, it’s fun that he identifies every stray person captured in faded Kodachrome as a cousin or neighbor, and shows a series of bizarre candids that supposedly document a family tradition of cross-dressing on wedding anniversaries. I haven’t seen so many middle-aged men in Bermuda shorts, high socks, and sandals since I was a kid. Inevitably, one slide is upside down. It’s all very amusing and, for us of a certain age, warmly nostalgic. And then it gradually morphs into this amazing story. McIlvain’s little anecdotes grow more and more bizarre, particularly his character’s father’s “weird drunk Christmas confession” about meeting a celebrity. Amid shots of his parents and other relatives posing at landmarks as “classic American tourists” — and his habit of wracking his brain to identify a location, then finding it clearly marked by a sign in the next picture — a larger tale emerges. SLIDESHOW drops audiences back in the time of Kodachrome colors, weaving a fictional family history around strangers’ real slides of long ago vacations. “Steve and Maisie loved hosting…” Josh McIlvain says in memory of his fictionalized parents in his piece, SLIDESHOW. What’s not fictionalized, however, is how the punchy-colored slides and humorous yet heartfelt prose McIlvain recites is as uncanny and nostalgic as some of our own family scrapbooks. This piece invites the audience to be mesmerized and taken on a journey about transition, tragedy and connection. While the projector setup sparks cringe-worthy memories of seventh-grade health class presentations, you’ll be exhaling when you’re within the intimate confines of a story that’s relatable and visually stimulating. Along with other old-school tunes, Sinatra crooned at the start of the show, followed by “Magic Carpet Ride” by Steppenwolf, all on old school portable equipment to match the projector. 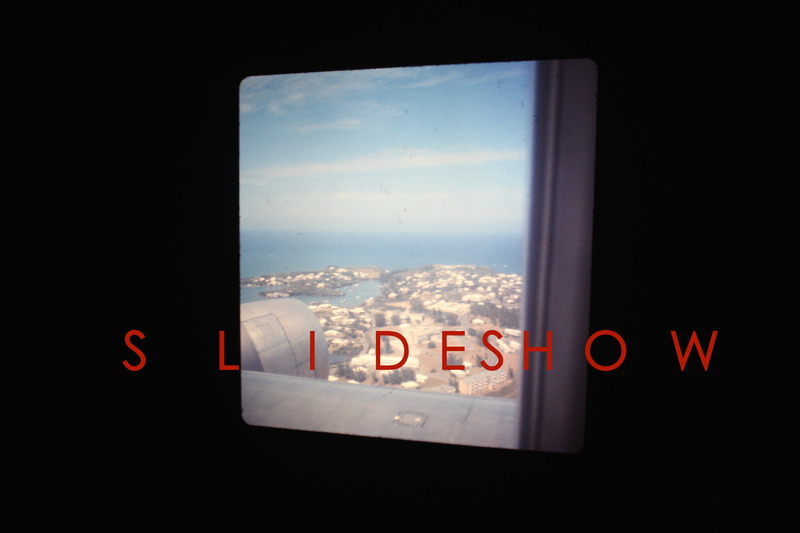 Interview with Josh McIlvain and the making of SLIDESHOW appeared in Phindie in September 2014. CLICK HERE TO READ THE PHINDIE INTERVIEW. SLIDESHOW, a multimedia production, written and performed by Josh McIlvain is an especially innovative and creative part of the 2014 Philadelphia Fringe festival. McIlvain is well known to Philadelphia Fringe aficionados as he has been involved in many aspects of previous Fringes (both festivals and productions). Historical and current McIlvain submissions provide their audiences with unusual and thought-provoking commentaries on life. SLIDESHOW follows that path incorporating McIlvain’s very creative technology decisions. According to McIlvain his use of slides “… is a natural platform for theater, where the audience experiences the show as it would a regular slideshow …”. Most audience members were of the age to remember going to their parents’ friends’ houses for an evening of slides showing highlights from a recent vacation or other special event. Headlong Studios could have been a sterile environment for what the audience would come to appreciate as a recollection of their memories of evenings comfortably spent in a darkened living or family room. McIlvain’s use of old media technology replaced that sterility with warmth and welcome. McIlvain uses a small portable cassette player, a white projection screen and scattered folding chairs to introduce the intimate audience to his unnamed narrator. The appreciation of any slideshow is enhanced by the personality and presentation of the narrator. McIlvain performs this narrator as a crucial element in understanding the depth and breadth of this particular life journey. SLIDESHOW is an emotional ride. The enthralling thing for the audience is that the trip is part personal and part experiential. In the beginning while slides are being shown of “the family” in their Easter best or around the Christmas dinner table, it is hard to keep one’s own familial thoughts from inserting themselves. But soon the realities of the narrator focus attention on the hows and whys of his own life. The narrator justifies the structure and use of the slides by fabricating a version of time itself with each and every person traveling on their own, unique timeline making any specific point in time simply an existing group of innumerable, separate timelines. SLIDESHOW tells the narrator’s story visually, vocally and viscerally. In SLIDESHOW, the audience laughs with, thinks about and struggles as the narrator displays his life with images frozen in time that become surprisingly moving. His story is both easy and difficult to decipher as he exposes his seemingly idyllic childhood as part of his parent’s era and then moves through his trials to build his own life. The narrator moves through the room during his commentary often superimposing his face and figure on the screen images adding to the senses of inclusion and exclusion. He becomes more and less profane as he incorporates unlikeable people and unlikely places into his existence. His chronicle exposes life as a puzzle and interprets missing puzzle pieces as his decisions to “do this” or “do that” in an attempt to make and fit into his own life. Most people of a certain age have a memory of something very distinctive, Chestnut Hill native Josh McIlvain said, and for this year’s Fringe Festival (Sept. 5 through 21), he’s tapping that experience in a new way. He said anyone who’s over age 35 remembers what it’s like to go to someone’s living-room slideshow. And his own idea for an original performance based around the concept of that old family-style get-together got started after his grandmother died several years ago, and he discovered the “monster” in her attic. It was a slideshow setup, and he calls it a monster because it weighed 20 pounds at least — quite a blast from the past now that sharing photos is as easy as taking a smartphone out of your pocket. The idea for his Fringe Festival premiere, “SLIDESHOW,” came together over time, beginning with a look at the images stored away in the attic. “The gist of the work came from seeing slides,” he says, of things like the old family house or a vacation on a lake. McIlvain, who has a degree in dramatic writing from Tisch School of the Arts, has spent a long time in different aspects of the creative life. Living in New York for many years, he’s been a playwright and a songwriter and rock-band front-man, as well as working on museum exhibits and publication layouts (he did this year’s Fringe Festival catalog). Revealing more than he should? The performance’s visual foundation is five slide carousels that McIlvain arranged and scripted as “chapters” in an overarching fictional story, developed as the artist pored over old slides from as long ago as the 1950s he bought on eBay. The writer/performer becomes his own character in the drama, aligning himself with the real people in the slides but also separated from them. “You’re sort of in an intimate space with somebody who’s maybe revealing more than you would be comfortable hearing from someone at a slideshow…You sort of see into his life, and the split between what his existence is and what their existence is,” he says of the experience. The show’s core images come from the vacation slides of an anonymous family whose pictures ended up on eBay, with a few other landscapes and shots from other batches worked into the narrative that McIlvain developed. It’s partly based on sorting through the images, and partly based on the story he wanted to write.